Thousands of protesters gathered in capital cities on the east coast today in a coordinated march against Indian energy giant Adani’s Carmichael mine and rail project. “It’s awful to see our leader feels like we shouldn’t have opinions and we shouldn’t care and they shouldn’t listen to us,” 14-year-old Jean Hinchliffe said in response to Mr Morrison’s calls last week for “less activism in schools”. Jean was the organiser of the Big School Walk Out in Sydney, which saw thousands of students leave classrooms and march through the streets. She spoke to more than 1,000 people at Sydney’s Town Hall Square on Saturday and said it was unlikely to be her last time marching against the Coalition. A national ReachTell poll conducted after the student strikes showed 62.7 per cent of the 2,345 surveyed agree school students have a right to “demand that the Morrison Government act urgently” on climate change. The number increased to 80 per cent among Labor voters, whose party were a target of fury at today’s protests for their perceived silence on the Carmichael mine. Like Jean, many young students who appeared at the rallies today were part of the thousands of Australian students who defied Scott Morrison’s call to stay in school. 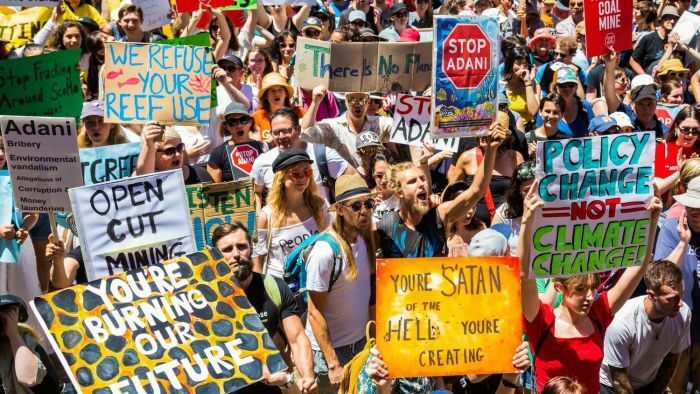 While school-aged students will not be eligible to vote in next year’s federal and state elections, they are becoming the face of the Stop Adani and climate strike movements determined to make it a persistent election issue. Daisy Jeffrey, 16, from Conservatorium High School in Sydney, said she was interested in a future in politics and Mr Morrison’s comments had galvanised her, and dozens of her peers, to take to the streets. “It wasn’t disheartening, it made us more angry and more determined to go out on the streets,” Daisy said. In addition to Sydney, rallies were held in Brisbane, Melbourne and Cairns. In Melbourne, hundreds of people sat down in the middle of the busy Flinders Street intersection, blocking traffic in a bid to draw attention to their cause. Mother Elizabeth Campbell said she was inspired by the children’s call-to-arms on an issue that will impact them the most. “We need a planet to live on, the kids are leading the way and I wanted to support them,” she said. An Adani Mining spokesperson said the company welcomed the democratic expression. “All we ask is that people’s opinions are based on facts and that they don’t put lives at risk through irresponsible, illegal and unsafe protest behaviour,” the spokesperson said.